The example in the image here shows the reminder being set up. It is set to be sent to the athlete's E-mail address and to their Phone via SMS. If a Reminder was sent to an e-mail it would include: from "support", then the "Name" and the "Message"
The email is sent from "support". Make sure you check that the athlete is receiving these and that they are not going to SPAM. An opened Daily Reminder; note how easy it is for the athlete to click the site address link IF you include it in the original mail message. 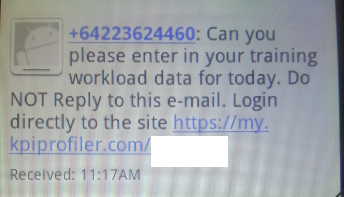 How the reminder appears if it was sent via SMS (Text Message). N.B. A different number appears each time the reminder is sent. You can include your organisation name or link. Another option might be to include a link to the Android Mobile application e.g https://my.siteaddress.com/site/m.html. For more information on the Android App see the Android App Help Manual. N.B. Internal Mail Reminders should ONLY be used it the athlete is logging into the system daily and is actively using the internal mail system. 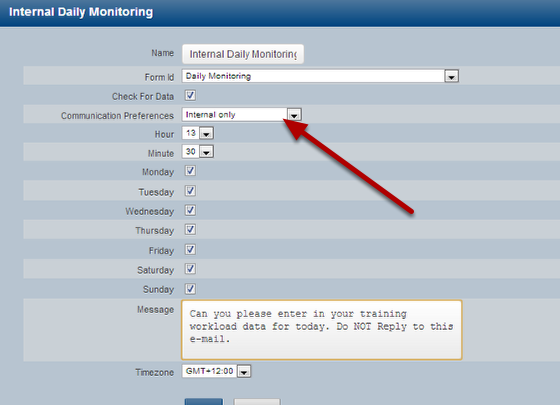 The majority of reminders will be set up using E-mail reminders to the athlete's external mail address e.g. @gmail, @hotmail etc. N.B. Internal Mail Reminders should ONLY be used it the athlete is logging into the system most days and is actively using the internal mail system. 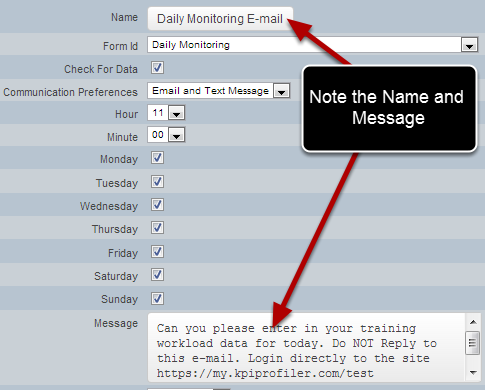 The majority of reminders will be set up using E-mail reminders to the athlete's external mail address e.g. @gmail, @hotmail etc.